jumping to movies from tv seems harder for those behind the scenes than those in front of the camera. there are more lake placid, mystery, alaska, malice than social network, travolta, clooney, stamos, or even kutcher. after winning multiple oscars for his first movie terms of endearment, but before the simpsons, james l brooks wrote and directed broadcast news starring holly hunter, william hurt, and albert brooks. the marketing would have you believe it’s a love triangle romantic comedy set in a dc news station, thank murrow it’s not. actually i guess it could technically be considered a romantic comedy. but to do so would be selling it short. 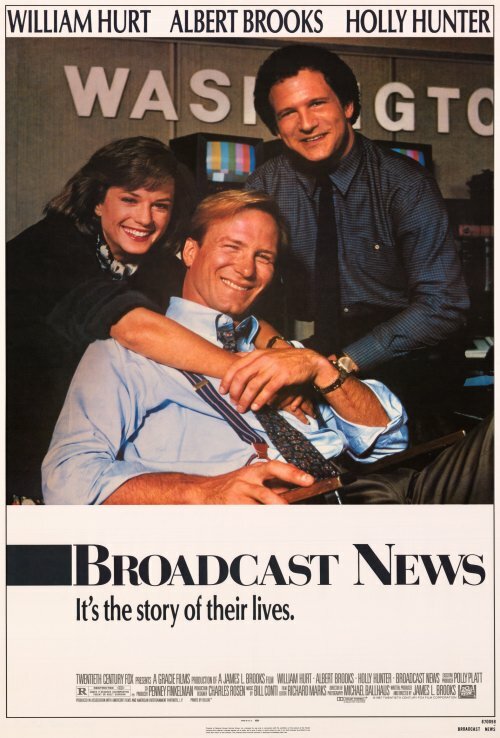 it involves the neurotic news producer played by holly hunter, the neurotic(it’s played by albert brooks, so that’s a given) tv reporter who wants to be an anchor, and william hurt’s pretty but not too bright anchor. unlike most rom-com®™s, or movies in general, actually, these characters actually have lives outside of what the screenplay or the genre requires. most of the movie we see them either at work, getting to work, or getting off work. it’s not one of those love stories where everything stops and characters stop their lives to decide who they love or who they want to be with. in fact, i’m pretty sure all the “dates” in the movie are work-related. it is refreshing to see people actually work and loving their work in movies. there are scenes here that may have inspired some of aaron sorkin’s tv works. the performances are great all around and the screenplay is superb. sure everyone knows holly hunter can act and albert brooks is pretty much like this in all his own movies(james l brooks acted in two of his movies), but i was quite suprised by william hurt playing the seemingly dumb but attractive anchor so well. i think the reason the film works so well is that the characters feel real and not stereotypes. there aren’t really dumb guys and talented guys, it’s just a bunch of guys good at different things. what i also like is how the film is not dragged down by the love triangle. the movie works in such a way that unlike most love triangles in movies, there isn’t a need to demonize one of the guys, so the female character would choose the right person. there’s no silly misunderstandings. on top of all that, there’s a scene with a big network tv news anchor near the end that contains my favorite line of the movie. it’s great cause it’s still true. released in 1987, few movies have been able to surpass it. it doesn’t have the superficial neurotica of brooks as good as it gets a decade later. it also doesn’t have the glorified and simplistic view of news in movies like the paper, nor the need to insert politics or current events a la american president. what’s most depressing is, with that revelation involving the william hurt character near the end, tv news has only gotten worse since then. broadcast news has just been released by criterion. this is based on the vhs version of the movie. vhs: the way 80s movies are meant to be seen. i still haven’t seen network, i think it’s on my queue. that’s an interesting connection to mtm show.